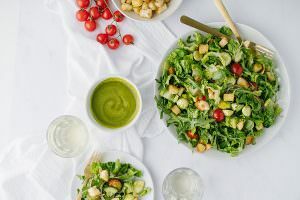 This recipe is a recipe that I have made over and over again, and every time, I fall in love with it even more. 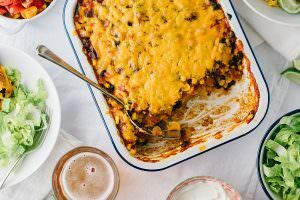 I found this recipe in the cookbook, Heartland: The Cookbook (which is one of my favorite cookbooks and has become a go-to in my kitchen), and it is so versatile and easy to make. The beauty of this recipe is that it does not require any kneading, and the dough can keep for 3 days in the refrigerator. I can make the dough in about 5 minutes, let it rise for a few hours, and from there I have made many incredible baked goods. I have used this dough to make challah, cinnamon rolls, sticky buns, Blueberry-Cream Cheese Strudel, and rolls. It always works perfectly, and the taste is incredible. It is a sweet dough, but not as rich as brioche, and has a very nice crumb. When made into challah, it makes a crazy delicious french toast. 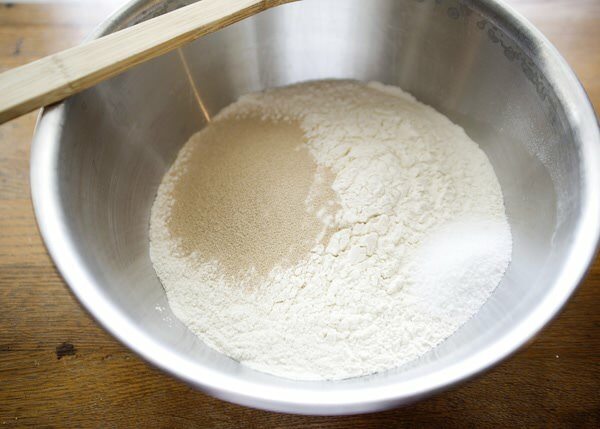 In a very large bowl, combine the bread flour, yeast, and salt. 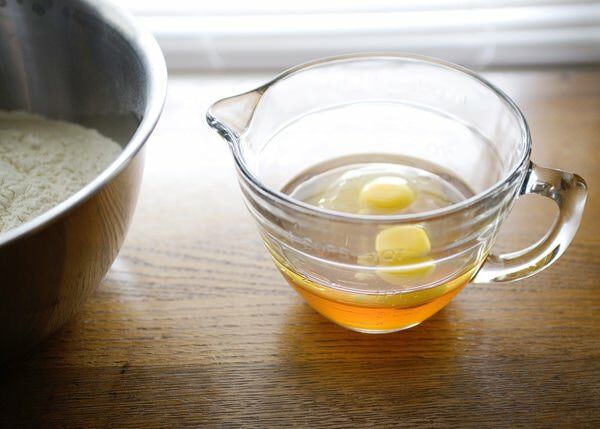 In a 4-cup measuring cup, add the honey, oil, and eggs. Add enough warm water to reach the 4 -cup mark. Pour the wet ingredients into the dry ones. Stir the mixture to combine, and then beat for 40 strokes. Scraping the bottom of the bowl. The dough will be lumpy and very sticky. Cover with plastic wrap, and let rise in a warm place for 2 hours. 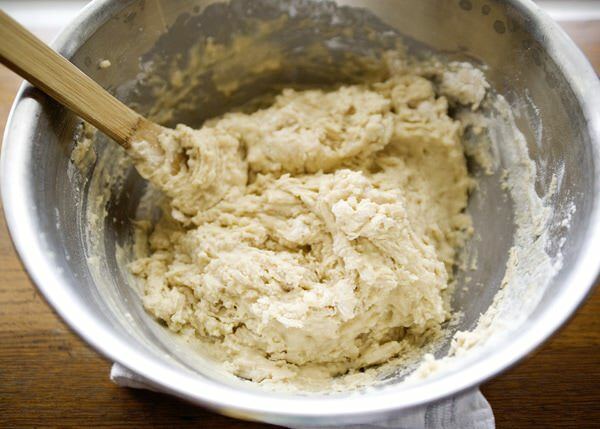 The dough will look spongy. At this point, you can make rolls, cinnamon rolls, whatever you want, but we are going to make challah breads. Cut the dough in half. You have enough for two loaves. You can save the other half in the fridge for something else if you want. 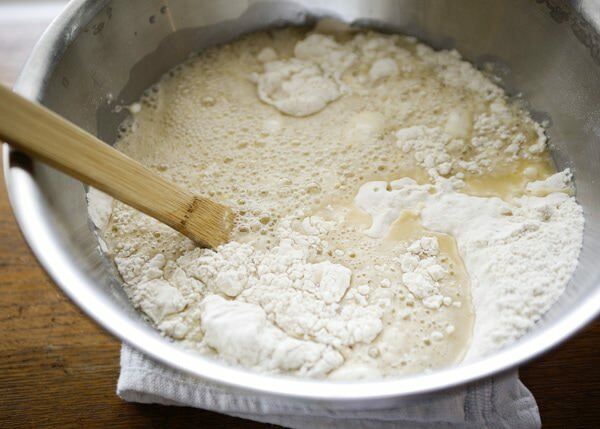 Pour the dough out on to a floured surface. 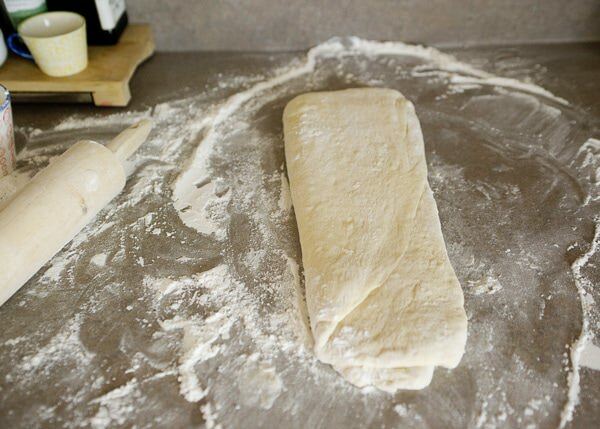 Roll the dough out into a large rectangle. 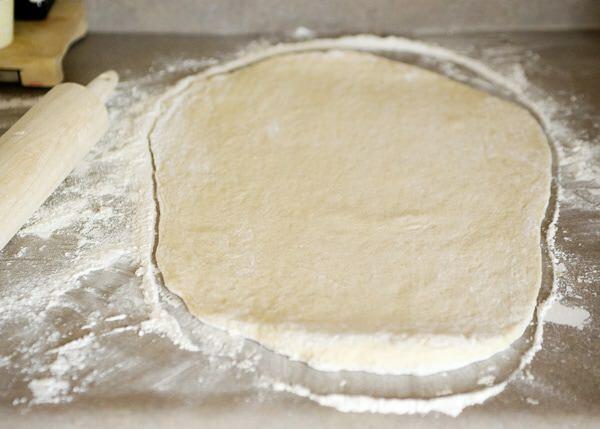 Fold the dough in half, turn a quarter turn, and roll again. Repeat this 3 times. 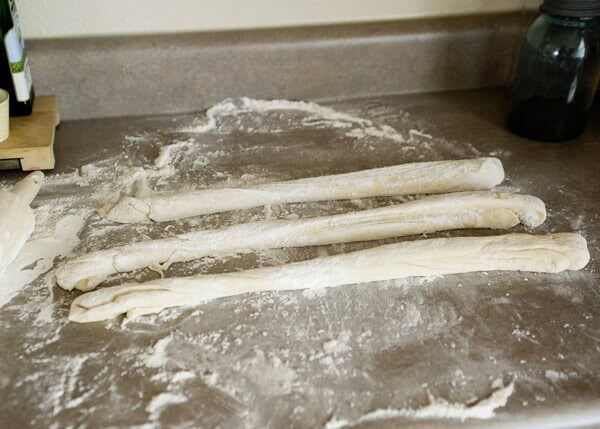 Form the dough into a cylinder, and cut it into 3 pieces. Roll each piece into a 16-inch long rope. You want to work with this dough as little as possible, so it does not have to be perfect. Take the 3 ropes and braid them together. Pinch the dough and fold it under at the top and bottom. Put the loaves on a parchment lined baking sheet and cover in a towel. Let rest for 40 minutes. Preheat the oven to 350 degrees. 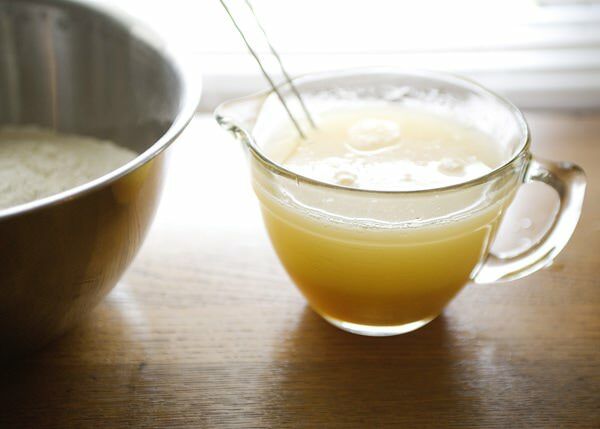 Make an egg wash (1 egg and 1 Tablespoon water whisked together) and brush it all over the loaves. You can sprinkle sesame or poppy seeds on it if you like. Bake for about 40 minutes. The internal temperature should be at least 190 degrees. Cool on a cooling rack. This looks so awesome and my Jewish husband would be soooo impressed if I pulled this rabbit out of my hat! Your challah looks so good, but I think I will use this recipe to make one of those long, cream cheese danishes with streusel for Christmas morning. Thank you for the recipe! 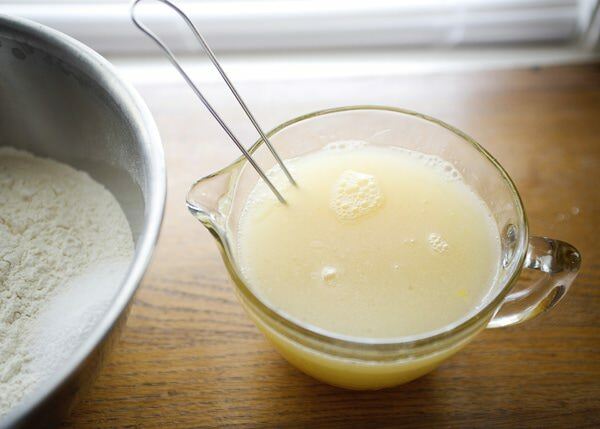 I know that this is a no-knead recipe, by why the caution that the dough should be worked as little as possible? 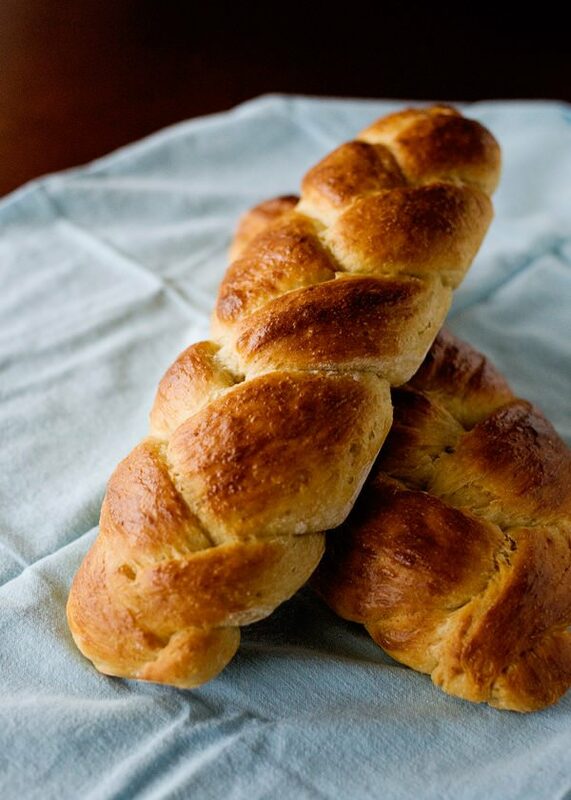 Wouldn’t a little gluten in challah be a good thing? This looks amazing! 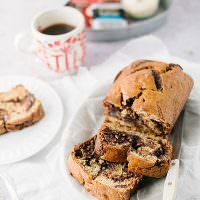 I love a recipe that has “no knead” in the title! 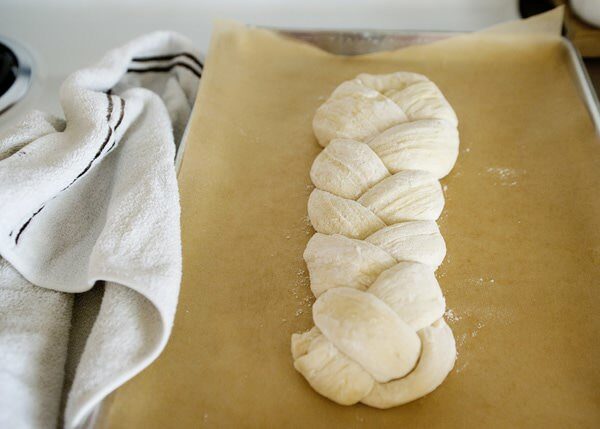 I Need to make this challah,yum!! Why am I so scared of yeast breads? I need to get over my fear and try this– you make it look so easy! Don’t be Kelley, it is not hard at all. Thank you for this great recipie and the gorgeous step-by-step visuals! I just made this challah tonight with my two little kids while we had this page open so we could compare our results with yours at each step. I substituted whole wheat flour for 1/3 of the required flour, and also mixed in some raisins. So easy, so delicious!! I am so glad! I love to hear about people baking with their children. It makes me so happy! I keep coming back to this recipe!! 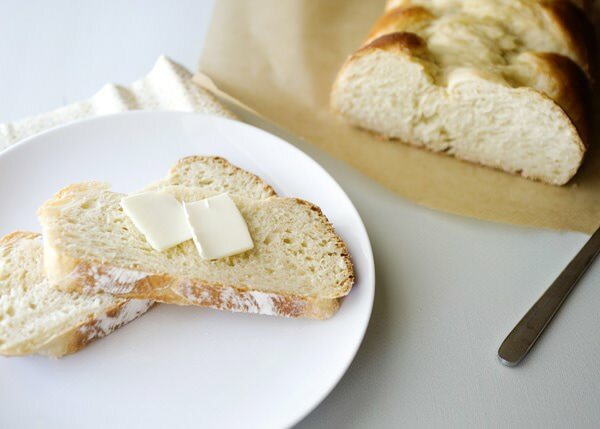 This bread is absolutely amazing and very easy to make!! On one of the batches I didn’t have any vegetable oil on hand so I used Coconut Oil….turned out delicious!! I am so glad, this recipe is so easy and so versatile. Glad to know that the coconut oil works too. This may be a silly question, but could you suggest a warm place? 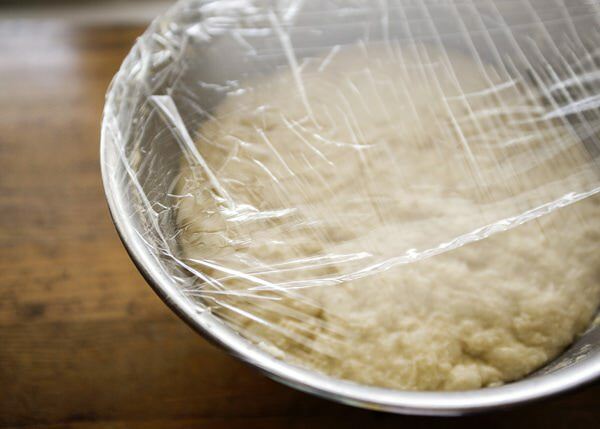 If I mix the dough in a plastic mixing bowl and put plastic wrap on it, I’m assuming I can’t put it in the oven… or can I on the lowest possibly temp? Also, could I use my kneading attachment and mix (40 strokes) the ingredients together with my kitchen aid mixer on slow? Sure, a warm spot next to a window, on top of the dryer. You can put it in a cold oven, but it scares me because I am afraid that I will forget about it and turn off the oven. You could use the kneading hook, but I find that it works better by hand. 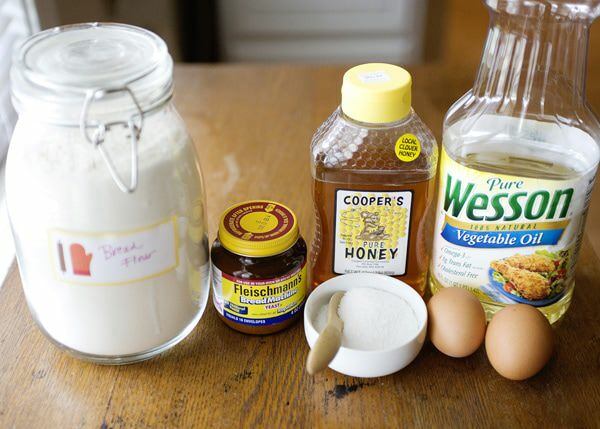 I have a simple question for you: can I make this recipe with active dry yeast instead of instant one ? I guess , I can but I want to hear from you. 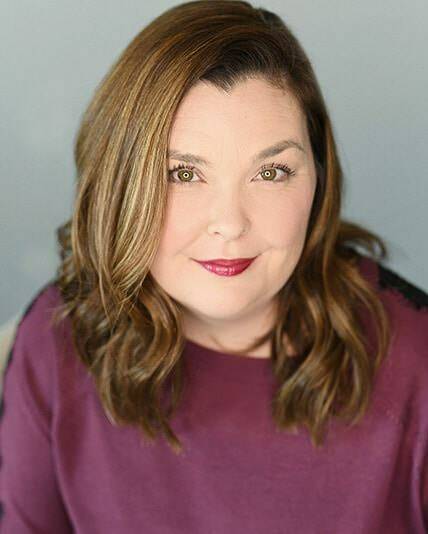 First off, I love your site. In 48 hours I’ve used about 7 of your recipes. I want to tackle the challah bread tomorrow but I only have time to make one loaf (small oven). I wanted to know how long I can keep this dough in the fridge to use to make sticky buns or another loaf later. A few days, 3 tops. Great recipe, I use it all the time. But it makes so much…can I just cut all the quantities in half to so I have no left over dough for the fridge? I don’t see why now. The other possibility is to bake two challahs and freeze one. I do that a lot and make french toast with it. Is there something I can substitute for eggs (so it can be vegan)? I don’t think so. Challah is an egg bread and maybe not a great recipe to try and convert. thanks for this recipe. I discovered it when you posted in in 2011 and have been using it every year to make my traditional Christmas sticky buns. The recipe calls for frozen bread roll dough and no one seems to make it anymore so I decided just to make the break myself. It is easy and perfect. 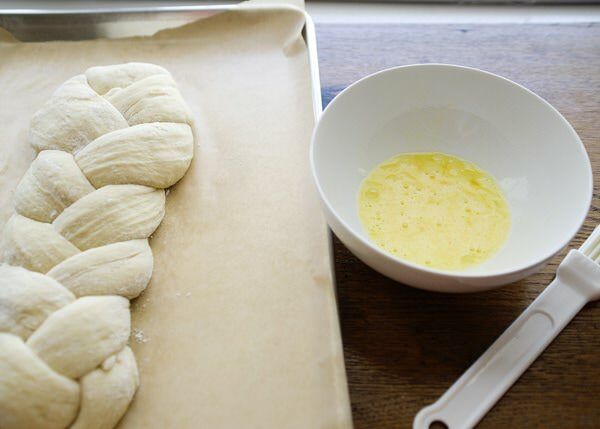 I use the other half and make a challah bread – it looks so pretty and is quite tasty. Thanks! You are so welcome. I’ve made cinnamon rolls with it, and it is perfect. This is my daughter’s favorite bread and I’ve been making it a lot lately. my dough was SUPER sticky and not so easy to work with. What did I do wrong? It is on the stickier side, but if it was too sticky to work with, add more flour. Bread recipes are never exact, there are many factors that are variable. The weather is a big one. Add a bit of flour a little at a time until it isn’t sticky anymore and you should be fine. Just tried making this. Like Josefa, my dough turned out much too wet. I’ve tried adding probably 1/4 cup of flour, but it’s still too wet. I’m afraid I’m handling the dough too much already, so I popped it in the fridge and will try again later. I’m not new to bread making or no-knead bread doughs, so I don’t know what I did wrong. I’ll let you know how it goes. It is a wet dough, and you can add up to a cup. Hope it turns out. 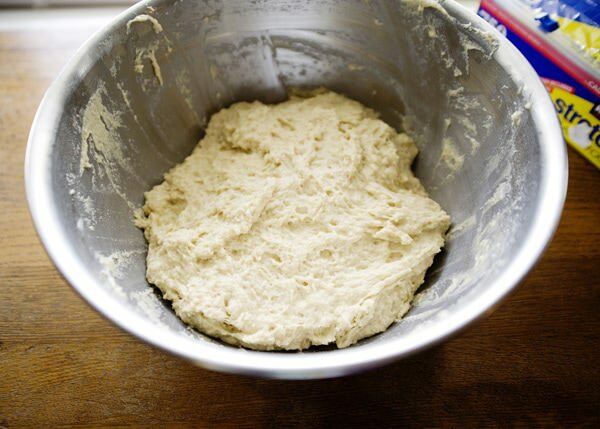 I make this dough all the time, it’s one of my favorite recipes.